This tiger museum is an online exhibition showcasing an expanding collection of folk art, toys and masks relating to tigers. They have been collected and donated from around the world. Tony has been collecting tiger artefacts for over twenty years. The tiger collection varies from tiny bronze castings to full size sculptures which include toys, graphics, paintings and masks. They have been collected by Tony, family and friends from over fourteen countries including Mexico, Guatemala, Thailand, India, Cambodia, China and Japan. He has commissioned artists in the U.K. and Nepal to create unique pieces for his collection. These artists are Dave Cox, Tony O’Hare, John Butler, Philippa Royle, Jude Edwards and Pancsa Kumar. Commissioned tiger sculpture by David Cox. 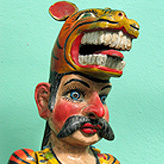 Mexican puppets relating to tiger dances and rituals. I hope to build the collection gradually over the years and in addition to the many tigers collected by friends and family from all over the world, I have commissioned two artists in the U.K. to create tigers for the museum, namely David Cox and Tony O’Hare. I am planning to commission one or two artists annually to create new pieces, and in the process creating an ongoing museum. A number of other artists are on my list to commission at the appropriate time. As I am committed to this and other projects I am unable to engage in correspondence with regard to commissions. The tiger museum has over 350 pieces and is growing. A great deal of the collection consists of tiger artefacts which show an amazing variety of form, colour, expression and technique. They range in scale from tiny bronze castings (heads and sculptures) to a three metre long tiger used in the Bridgwater Carnival in Somerset, U.K. The collection shows the creative diversity of a single subject matter. I've been to Antigua which is the old capital of Guatemala and I had one or two memorable adventures in the busy and heady markets of this city and towns nearby. Guatemalans wear colourful hand made clothing which they wear for themselves and not for tourists and these garments are individual to different villages. There were some very hot days and outside of gleaming white cathedrals on steep steps there were a hundreds of people gathered enveloped in huge clouds of swirling incense. In these daily markets I saw fruits and vegetables which were completely new to me. There was also the hustle and bustle of art and craft markets where we were assailed on all sides by traders. It was in these markets that I began to discover masks and sculptures completely different from neighbouring Mexico. The most exciting find were the Dancing Tiger men sculptures - a wonderful surprise and an unique addition to this Tiger Museum. Sculpture of Tippoo’s tiger based on the Automaton in the V&A museum, which moves and makes sounds.